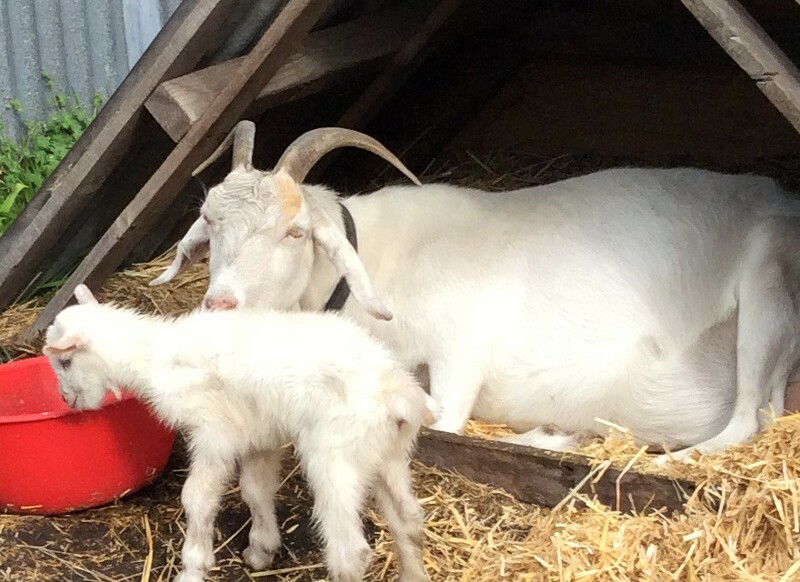 With Ruby’s death still very raw for us all, it was with mixed feelings that we discovered Geraldine and Leia, tucked deep in their houses out of the torrential rain and well on their respective roads to motherhood. 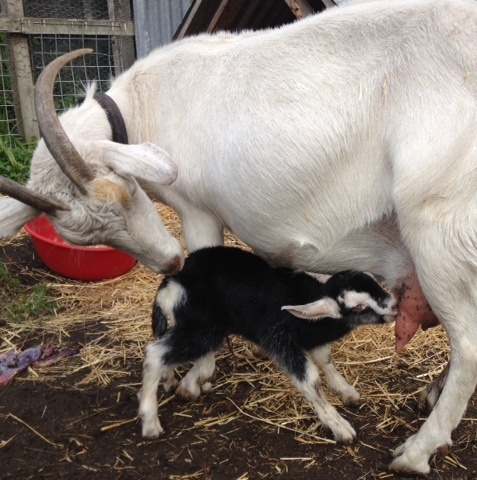 The Goat Herd was on hand to witness the arrival of kid number one; a healthy, strong doe complete with wattles and looking every inch the pure-bred Saanen princess. 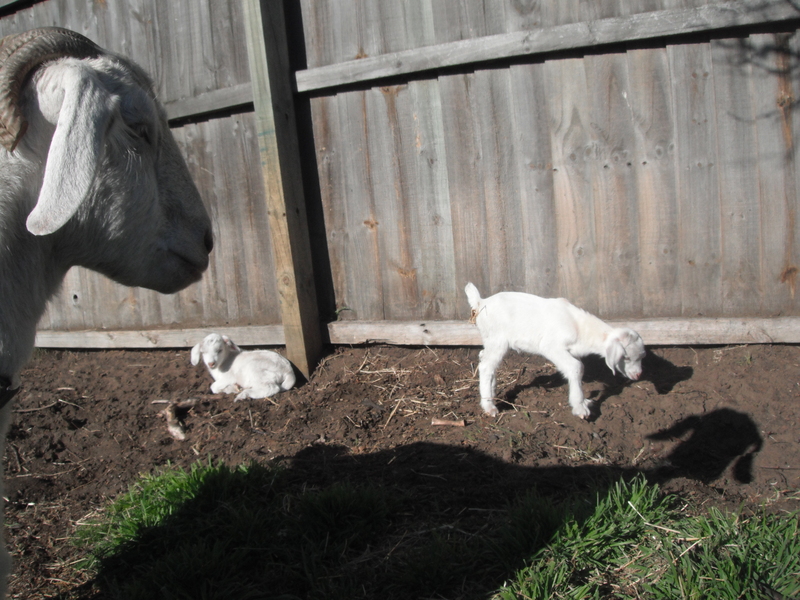 Which made the arrival of her equally healthy brother a little surprising. Auntie Leia watched from a respectful distance, removing herself to the end of the paddock as night fell and making it very clear our presence was not required. We human Homesteaders tried not to dwell on her choosing the same patch of earth Ruby had just over a week earlier and left her to it. We did take turns to check on proceedings half hourly, though. “She’s fine,” The Renovator reported at 10 pm, “Calm, laid back, she even let me pat her. I think everything may have stopped for the night and she’s settling down to sleep.” We decided to retire too; all, that is, except The Bean Counter who likes to spend a little time each evening in the company of espn fc. I think everyone heard the click of the door as he decided to check just once more. We certainly all heard his return! Did you perhaps hear him? He was just a little over-excited! This soundtrack to our life does not always make easy listening; but then it’s not all wailing violins either. And it’s all very upbeat on the Homestead right now. 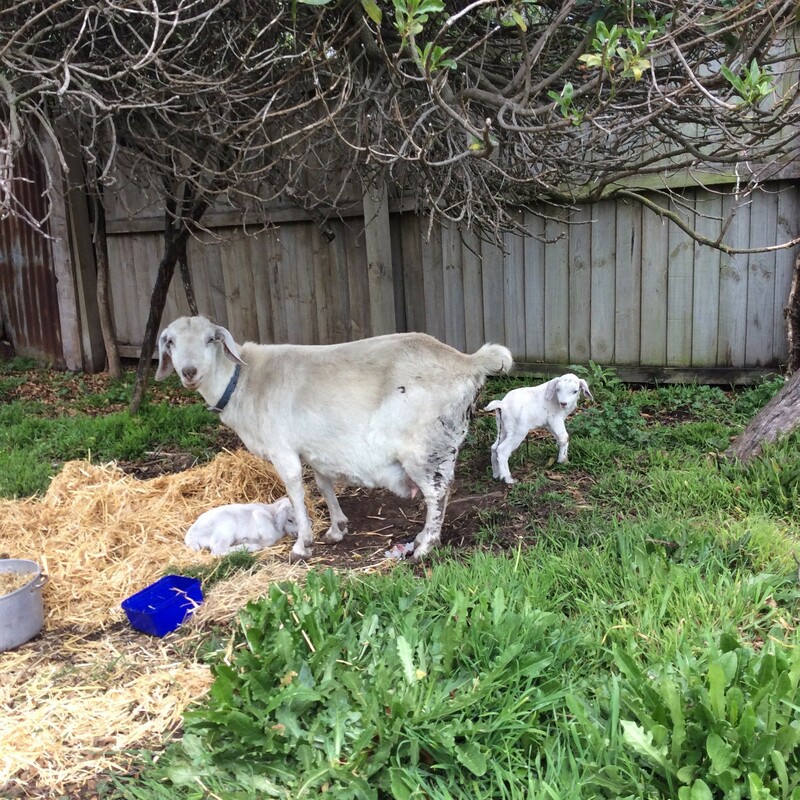 This entry was posted in Goats, Union Homestead and tagged Aotearoa, babies, baby goat, baby goats, British Alpine, Christchurch, farm, farmlet, Goat, goat birth, goats, Homestead, Homesteader, homesteading, kid, kids, micro farm, new arrivals, New Brighton, New Zealand, Otautahi, Saanen, urban farm. Bookmark the permalink. My! Two lots of twins, I hope that helps to make up for the loss of Ruby. Congratulations. 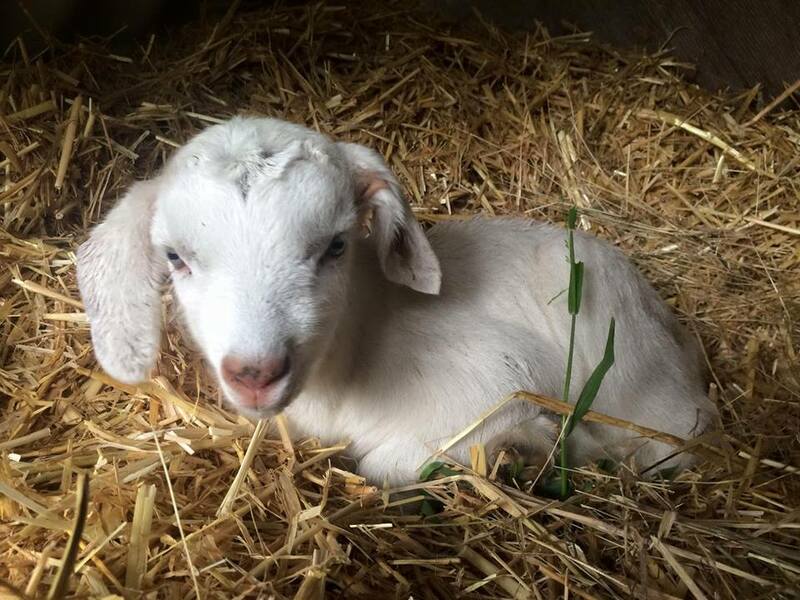 There may quite possibly be nothing quite as cute (and I really hate that word, but it’s the right one for these little ones) as new goat kids. One set is buck and doe, what’s the other set? Besides adorable, I mean? So glad things went smoothly. You talk about the beat going on, but it makes me think of the old adage, which you’ll know well, living by sea as you do – every seventh wave is a big one. The waves come in some gentle lapping, some with a regular surge, and every so often there’s a powerful roller that swamps the castle or the picnic and sends us all scrambling. And then the next minute, it’s back to little lapping waves, gentle surges, etc. Leia’s twins were one of each as well, but with the buck born first. Yes, cute is pretty much outlawed in this place too (Farm Girl still shudders about the time an acquaintance shrieked in her face that she was a “cute little poppet”). The wave adage sums up recent events here perfectly. With both blogable and things that didn’t make the cut, we’ve been utterly swamped recently. Here’s to a bit of smooth sailing for a while. What wonderful news! I am so pleased two lots of twins were delivered safely! I expect they are! After a day or two they start jumping and prancing about – so sweet! I hope that good moments outweigh the rockier ones. Congratulations! 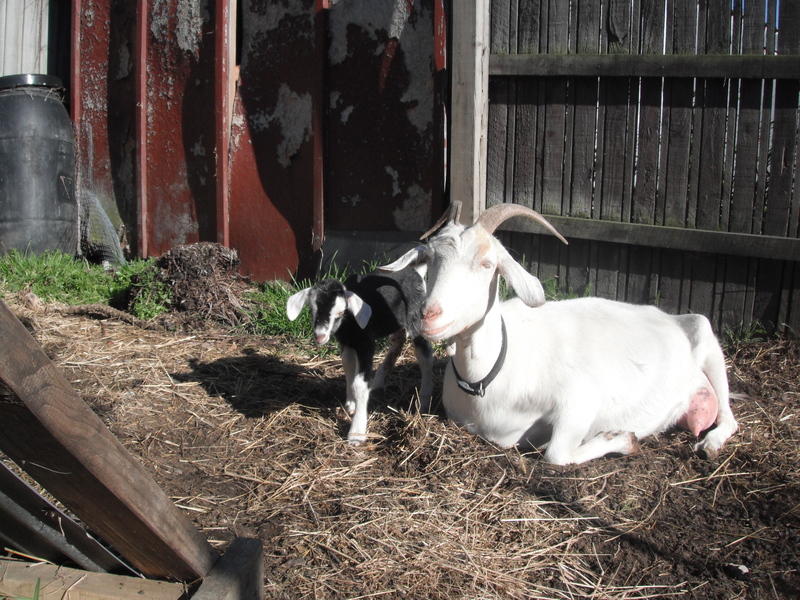 Are you having fantasies about goats milk cheese in the future? Most definitely; and this year we’ll try and not devour it all before the winter months set in!